There are many kinds of audio shows. On one end there's a dealer renting a suitable location like a small castle, a clubhouse on a golf course or another venue that by itself already makes the journey attractive. Distributors often have somewhat larger budgets to organize an event for their dealers across a few hotel rooms. Then come the big commercial shows run by companies or organizations which make their living from shows. Now exhibitors have to dig deep into their pockets as exhibit space gets costly but the organizer's name and fame attract many visitors. These visitors could be exclusively trade, just consumers or a mix of the two. Entrance fees are mostly fair since the exhibitors cough up the bulk of the costs plus then some. Then come a few outlier events. One kind is strategically organized to make money and end the year in the black. Often these type shows are organized by distributors who 'invite' their dealers together with fellow distributors and their dealers. Not exhibiting becomes bad for one's business by perception. Can't afford to show up? Probably not long of this world. Even though the investment will be substantial, it might be the only opportunity in a year to reach out to yet unknown customers. In the vast majority are simply customers who are happier to look than buy. Making show sales is a rare phenomenon. 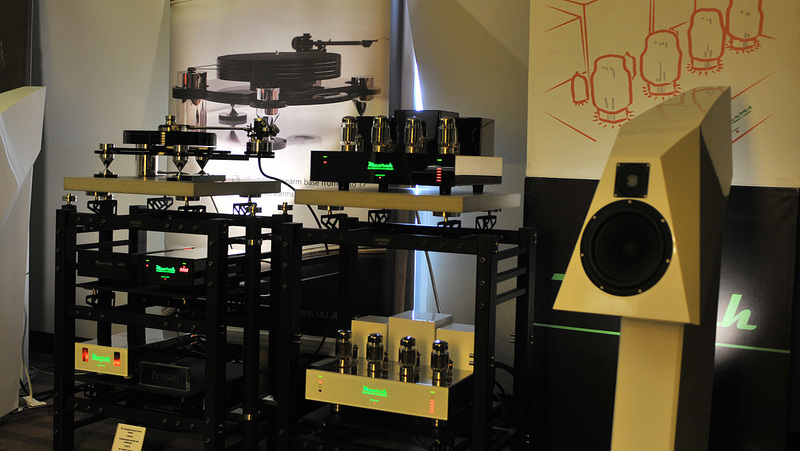 The last category of audio show is the enthuasist's do. Here the organization is not primarily a cash cow milking exhibitors but about an enthusiast's investment in the industry. From gear to exhibitors to visitors, everything and everyone is cared for and catered to. 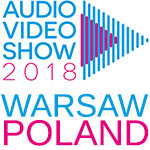 It is this last category to which the annual Audio Video Show of Warsaw belongs. With a small team of volunteers, Adam Mokrzycki manages to run an event that's still growing after 20 years, is very well attended and runs as smooth as can be. Of course things not anticipated still occur—the Tao shits, too—but they are handled and settled without fuss. Once again Adam invited us and once again we accepted with pleasure. Doing a show as journalists isn't solely about having fun. It's also exhausting, with long days on your feet facing crowds and awaiting photo ops without too many people in the frame. Those are the physical aspects. The mental aspects come from actual listening. After x number of rooms, the part of the brain dealing with hearing gets overwhelmed, loses sharpness and needs a reboot. The best way for a reboot is a really good-sounding room. Of course all rooms advertise themselves as such but finding one which actually delivers to do the trick… boy, that is challenging. With a show the size of Warsaw, returning to such a one is mostly just not feasible. Hence the endemic fatigue factor. Talking about size, here are some figured for this 22nd edition: 3 venues, 26 hours of show time across 3 days, 200 exhibitor rooms, at least 28 audio-related seminars and presentations including Anna Maria Jopek, Jean Michel Jarré, Ken Kessler, Michael Fremer and Ken Ishiwata/Marantz. This confronts one with upfront choices which determine one's experience. 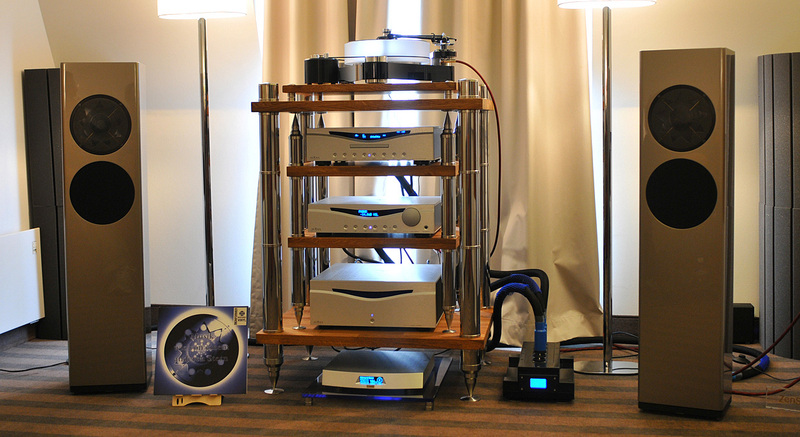 We would concentrate on audio and more specifically, personal novelties or setups different from past showings. Many exhibitors tend to copy'n'paste successful setups from previous years, even book the same room year after year. Proven that recipe may be but exciting it ain't! So playbook in hand, we set out Friday for the Golden Tulip across the intersection from the Radisson, looking forward to Sveda Audio + LampizatOr, the SoulSonic speakers which changed venue from last year, then Destination Audio's latest speakers. Alas, our bad as we did not check the published schedule. 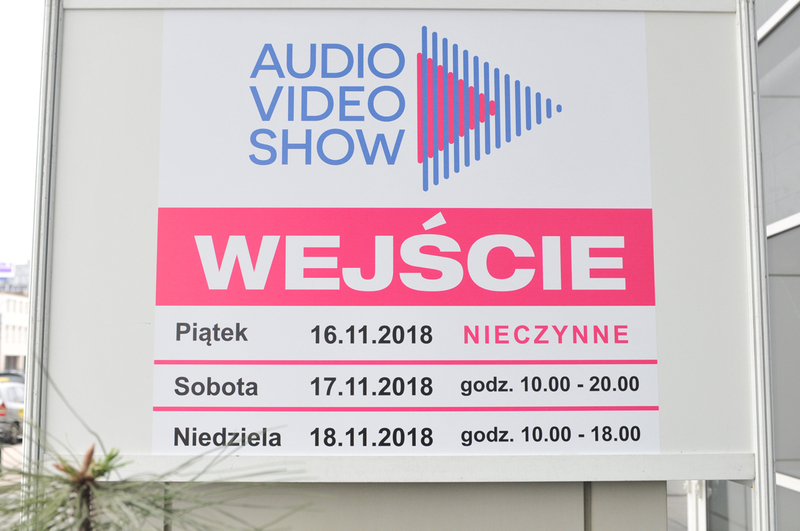 The Golden Tulip was closed for the Audio Show as the nieczynne by the entrance indicated. Show organizer Adam was 'not pleased' with this as he had booked that venue for many years in advance with an extensive track record for cooperating. For 2018, his booking there was cut short by one day, thus reduced to just Sat/Sun. So we returned to the Sobieski hotel and started at the 7th floor to work our way down. Saturday would be Stadium day, Sunday for the Golden Tulip and the remainder of the Sobieski. On our way back to the Sobieski, our eye caught a scarily realistic mural of a building on fire and a fire fighter rescuing a man. Muarah are a Polish brand with a distinct love of analogue. Of course there is support for digital too but tubes and vinyl are the focus. A signature detail regardless is a bright green logo on the gear à la McIntosh. This year the top-line MT-1 turntable ran the new Jelco TK-950 tone arm and the Precision Speed Controller was now in full production. Loudspeakers of choice were Italian Nime Audio Elite Two 92dB 2-ways whose elongated form recalls the head of Ridley Scott's alien. This year room decor got more attention by way of a collection of paintings by local artist Micha? Wo?niak. No surprise that their main color was green. LampizatOr have become one of the bigger Polish names for tube gear. 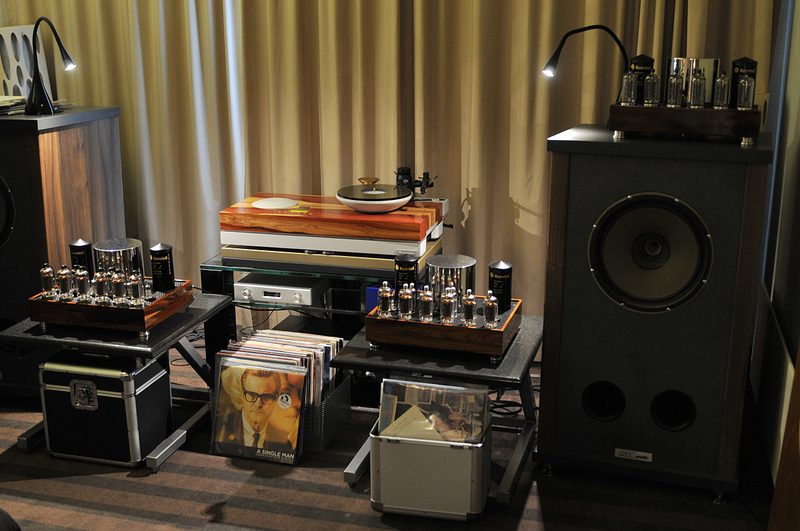 Their room sported a full deck of Atlantic DAC and 211-based amplifiers. Speakers on duty were the Lithuanian 8mm audiolab Piu and Piu Mini. We listened to the bigger floorstanders in Premium guise and the sound matched the looks of the 3-way with its big 12" woofer. 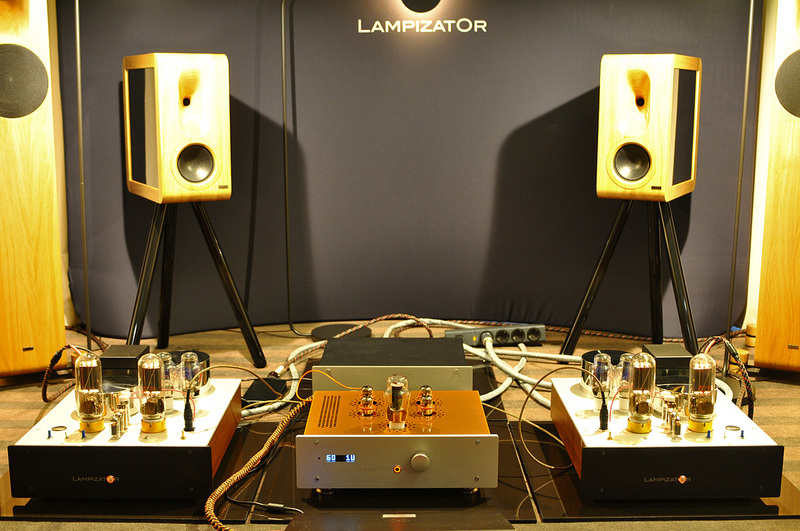 The LampizatOr electronics mixed very well although the highly elegant looks of the speakers contrasted with the laboratory looks of the cables running left right and center. More Polish hifi follow with Sky Audio specializing in OTL designs. Their 120-watt monos with 6P45C tetrodes drove their own Tannoy-inspired speakers with ease. Landsmen Tentogra supplied their huge battery-powered turntable with Kuzma arm. Daniela Manger had brought her P2 loudspeaker with Audio Flight electronics and Scheu turntable to show off her passive 2-way with its signature flat widebander covering 80Hz to 40kHz to bathe the room in very pleasant sound. Bass extension was augmented by two passive radiators at the back to assist 80Hz and below. At the time of our visit, one of our frequent flyers, Melanie De Basio's No Deal, was on spin. This album is somewhat ambient, serene and dreamy but offers deep bass with Melanie's voice and sparse instrumentals meandering about. We liked what we heard.